Joseph Jason Namakaeha Momoa (born August 1, 1979) is an American actor, writer, film producer, and director. He is known for portraying Aquaman in the DC Extended Universe, beginning with the 2016 superhero film Batman v Superman: Dawn of Justice, and in the 2017 ensemble Justice League and his 2018 solo film Aquaman. He is also known for his television roles as Ronon Dex on the military science fiction television series Stargate Atlantis (2004–2009), Khal Drogo in the HBO fantasy television series Game of Thrones (2011–2012), and as Declan Harp in the CBC series Frontier (2016–present). An only child, Momoa was born in 1979 in Nānākuli, Honolulu, Hawaii to Coni (Lemke), a photographer, and Joseph Momoa, a painter. He was raised in Norwalk, Iowa, by his mother. His father is of Native Hawaiian ancestry and his mother is of German, Irish, and Native American descent. After high school, Momoa attended college and initially majored in marine biology before switching to wildlife biology. In 1998, Momoa was discovered by designer Eric Chandler and Takeo Kobayashi, who encouraged his modeling career. Momoa won Hawaii's Model of the Year 1999 and hosted the Miss Teen Hawaii contest. At 19 years old, he also worked part-time in a surf shop before being cast in the action drama series Baywatch Hawaii, where he appeared as Jason Ioane (1999–2001). In addition to his appearances in North Shore (2004–2005), Johnson Family Vacation (2004), and Stargate: Atlantis (2005–2009), Momoa was cast as Roman in four episodes of the comedy-drama television series The Game (2009). He portrayed the title protagonist in Conan the Barbarian (2011), a reimagining of the 1982 film of the same name and a role made famous by Arnold Schwarzenegger. Momoa gained his role of Khal Drogo on HBO's Game of Thrones through his audition, in which he performed a Haka, one of many intimidating Māori dances traditionally used to celebrate life. Momoa directed and co-wrote Road to Paloma (2014), an American drama thriller film, together with writers Jonathan Hirschbein and Robert Homer Mollohan. The film stars Momoa, Sarah Shahi, Lisa Bonet, Michael Raymond-James, and Wes Studi. It premiered at the 2014 Sarasota Film Festival in April 2014. The film had a limited theatrical release on July 15, 2014 in New York City and Los Angeles and a VOD release. In June 2014, Momoa was reported to have been cast in the role of Aquaman. He first played the role in a cameo in the superhero film Batman v Superman: Dawn of Justice, marking Aquaman's live action theatrical debut. Momoa played the character in a leading role in the 2017 ensemble film Justice League. He then starred in the Aquaman solo film, which released in late 2018. He is also set to reprise this role in The LEGO Movie 2: The Second Part. In 2014, Momoa portrayed Connor in the Canadian horror action film Wolves, and starred in the sci-fi horror movie Debug; it was written and directed by Momoa's former Stargate Atlantis co-star, British-born Canadian actor David Hewlett. In February 2015, it was announced that he would portray a cannibal in the drama thriller film The Bad Batch. In 2015, Momoa was cast in the Canadian action film Braven, which was released on February 2, 2018. In early 2017, he signed onto the official Just Cause movie series. In February 2019, Momoa was cast as Duncan Idaho in the upcoming Denis Villeneuve film Dune. Momoa at San Diego Comic-Con International in July 2017. Momoa began a relationship with actress Lisa Bonet after mutual friends introduced them in 2005. Although it was previously believed that Momoa and Bonet married on November 15, 2007, the couple did not legally marry until October 2017. Through his marriage to Bonet, Momoa became the stepfather to Zoë Kravitz. In July 2007, Bonet gave birth to their first child, a daughter. Their second child, a son, was born in December 2008. Momoa's mother announced the birth. In December 2017, Momoa was featured in the Men's Health magazine on the cover and with an article detailing his fitness routine for Aquaman. Momoa learned martial arts for his role as Ronan in Stargate Atlantis and for Conan. In 2017, Momoa started practicing Brazilian jiu-jitsu. On November 15, 2008, Momoa was slashed in the face with a broken beer glass by a man during an altercation at the Birds Cafe, a tavern in Hollywood, California. He received approximately 140 stitches during reconstructive surgery and the scar is apparent in his later work. Momoa has several tattoos. The most prominent is the tribal half-sleeve featuring nine rows of black triangles encircling his left forearm. Momoa has explained that the tattoo is of his aumakua, his Hawaiian family's crest, the manō, or shark. The triangles represent shark teeth. He said, "It's supposed to take the darkness out of your heart and bring the light in, but we're still working on that." On his right outer forearm, Momoa has a tattoo that reads "Être toujours ivre", which roughly translates from French as "Always be drunk". His step-daughter, Zoë Kravitz, and his castmate from Series 1 of Game of Thrones, Jamie Sives, have identical tattoos in the same place. On his right inner forearm, Momoa has a tattoo that reads "Pride of Gypsies", the name of his film and commercial production company. He has a memorial tattoo on his middle right finger, which reads "Diablo", in memory of his grandfather who passed away in 2013. He also has a small skull between his right thumb and forefinger. Momoa also has the signatures of his two children with Lisa Bonet, tattooed over his left pectoral in red ink. 2018 Himself (host) Episode: "Jason Momoa/Mumford & Sons"
↑ McNary, Dave (January 21, 2010). 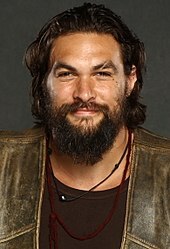 "Momoa Set for 'Conan'". Variety. Retrieved February 23, 2019. ↑ McMillian, Graeme (October 20, 2014). "Jason Momoa Talks 'Aquaman' Plans, Confirms 'Justice League' Appearance". The Hollywood Reporter. Retrieved February 23, 2019. 1 2 3 "Exclusive: Jason Momoa Talks CONAN; Reveals He's Writing and Directing ROAD TO PALOMA". Collider. Retrieved February 23, 2019. 1 2 3 4 "Hawaii-born actor Jason Momoa's 'Aquaman role parallels own upbringing". Star Advertiser. December 16, 2018. Retrieved February 23, 2019. ↑ Ahmad, Sophia (February 19, 2010). "Iwalk's Conan star Jason Momoa". Blogs.desmoinesregister.com. Archived from the original on April 8, 2013. Retrieved February 23, 2019. ↑ Lalor, Cadeem (August 9, 2018). "42 Imposing Facts About Jason Momoa". Retrieved February 23, 2019. ↑ Rampell, Ed (January 3, 2019). "'Aquaman': The life aquatic with Hawaiian Polynesian Power superhero Jason Momoa". Peoples World. Retrieved February 23, 2019. ↑ Wagner, Curt (March 4, 2014). "Jason Momoa takes 'The Red Road'". The Chicago Tribune. Retrieved February 23, 2019. ↑ Fleck, Chris (December 19, 2012). "Takeo Kobayashi". Midweek.com. Retrieved February 23, 2019. ↑ ""Game of Thrones" Star Jason Momoa". KatieCouric.com. Archived from the original on September 4, 2014. Retrieved February 23, 2019. ↑ Kelly, Helen (May 5, 2016). "Game of Thrones: Jason Momoa is unrecognisable as young model before Khal Drogo role". Daily Express. Retrieved February 23, 2019. ↑ "Game of Thrones' Jason Momoa Tells the Origin Story Behind His Viral Audition". Time.com. January 20, 2017. Retrieved February 23, 2019. ↑ "East Coasters lead Kapa Haka group in Timor Leste". infonews.co.nz. March 11, 2008. Retrieved February 23, 2019. ↑ "Jason Momoa's 'Road to Paloma' to Premiere at Sarasota Film Festival". Variety. March 12, 2014. Retrieved February 23, 2019. ↑ Schwartz, Terri (February 26, 2014). "Jason Momoa landed 'The Red Road' thanks to his directorial debut 'Road to Paloma'". Blog.zap2it.com. Archived from the original on March 2, 2014. Retrieved February 23, 2019. 1 2 Lesnick, Silas (March 12, 2014). "Cary Elwes and Jason Momoa to Climb Sugar Mountain". ComingSoon.net. Retrieved February 23, 2019. ↑ Ford, Rebecca (March 12, 2014). "Cary Elwes, Jason Momoa Join Indie 'Sugar Mountain'". The Hollywood Reporter. Retrieved February 23, 2019. 1 2 "The Red Road Cancelled By SundanceTV After Two Seasons". Seriable.com. May 23, 2015. Archived from the original on August 26, 2016. Retrieved February 23, 2019. ↑ Sciretta, Peter (June 14, 2014). "Jason Momoa Is Aquaman in 'Batman V Superman: Dawn Of Justice'". /Film. Retrieved February 23, 2019. ↑ McWeeny, Drew (June 14, 2014). "Jason Momoa Will Play Aquaman in 'Dawn of Justice', and We Know how It Will Happen". Hitfix. Retrieved February 23, 2019. ↑ Ford, Rebecca; Kit, Borys (June 16, 2014). "Jason Momoa to Play Aquaman in 'Batman v. Superman: Dawn of Justice'". The Hollywood Reporter. Retrieved February 23, 2019. 1 2 Dice, Andrew (October 15, 2014). "It's Official: Jason Momoa is 'Aquaman'; Solo Movie Coming 2018". Screen Rant. Retrieved February 23, 2019. ↑ "DC Comics Movies Announced: 'Suicide Squad,' 'Wonder Woman,' 'Justice League,' 'The Flash,' 'Aquaman'". Slashfilm. Retrieved February 23, 2019. ↑ Kroll, Justin (June 3, 2015). "James Wan to Direct 'Aquaman' for Warner Bros". Variety. Retrieved February 23, 2019. ↑ Hughes, William. "Jason Momoa's Aquaman will splash around in The Lego Movie 2". Retrieved February 23, 2019. ↑ Jones, Gareth (February 28, 2015). "UK Exclusive: Wolves Gag Reel Serves Up a Few Howlers". DreadCentral.com. Retrieved February 23, 2019. ↑ Barton, Steve (February 6, 2015). "Jason Momoa Eats a Bad Batch of Human Flesh". DreadCentral.com. Retrieved February 23, 2019. 1 2 Sneider, Jeff (February 6, 2015). "Jason Momoa in Talks to Star in Cannibal Love Story 'The Bad Batch' for Annapurna, Vice (Exclusive)". Retrieved February 23, 2019. ↑ McNary, Dave (March 7, 2017). "'Aquaman's' Jason Momoa to Star in 'Just Cause' Film Adaptation". Retrieved February 23, 2019. ↑ "Jason Momoa lands Just Cause movie lead". newshub.co.nz. August 3, 2017. Retrieved February 23, 2019. ↑ Goldberg, Lesley (July 10, 2018). "Jason Momoa to Star in Apple Drama 'See'". The Hollywood Reporter. Retrieved February 23, 2019. ↑ Otterson, Joe (July 10, 2018). "Jason Momoa to Star in Apple Sci-Fi Series 'See'". Variety. Retrieved February 23, 2019. ↑ Fleming Jr, Mike (February 14, 2019). "'Aquaman's Jason Momoa Joins Killer Cast Of Denis Villenueve's 'Dune'". Deadline Hollywood. Retrieved February 23, 2019. ↑ Kroll, Justin (February 14, 2019). "Jason Momoa Joins Timothee Chalamet, Javier Bardem in 'Dune' Reboot". Variety. Retrieved February 23, 2019. 1 2 Allin, Olivia (August 20, 2011). "Jason Momoa of 'Conan the Barbarian' talks about his horse fears". OnTheRedCarpet.com. Retrieved February 23, 2019. ↑ "Jason Momoa and Lisa Bonet Just Got Officially Married: Details on Their Secret Wedding". Us Weekly. November 2, 2017. Retrieved February 23, 2019. ↑ "Lisa Bonet's New Baby's Name Is a Mouthful". Access Hollywood. January 9, 2009. Retrieved February 23, 2019. ↑ "This Is How Jason Momoa Got Ripped Enough to Play Aquaman". Men's Health. January 1, 2017. Retrieved February 23, 2019. ↑ "Jason Momoa on Martial Arts". August 14, 2009. Archived from the original on March 4, 2016. Retrieved February 23, 2019. ↑ "Jason Momoa Biography". Archived from the original on March 4, 2016. Retrieved February 23, 2019. ↑ "Jason Momoa Trains Jiu-Jitsu". BJJEE. Retrieved February 23, 2019. ↑ "Jason Momoa's Instagram post". Retrieved February 23, 2019. 1 2 "Man Pleads Not Guilty To Assaulting "Stargate Atlantis" Actor". KNBC. July 17, 2009. Retrieved February 23, 2019. ↑ Winton, Richard (October 7, 2009). "Five-year sentence for man who attacked 'Stargate Atlantis' actor Jason Momoa". Los Angeles Times. Retrieved February 23, 2019. ↑ "Jason Momoa Explains Spiritual Meaning Behind His Sleeve Tattoo". April 6, 2017. Retrieved February 23, 2019. ↑ "@prideofgypsies on Instagram". Retrieved February 23, 2019. ↑ "@zoeisabellakravitz on Instagram". Retrieved February 23, 2019. ↑ "Pride of Gypsies website". Retrieved February 23, 2019. ↑ Jason Momoa Supercon (July 19, 2014). Florida Supercon 2014 Jason Momoa Q&A. Florida Supercon. Retrieved February 23, 2019. ↑ Parker, Brinton (August 9, 2016). "Your Comprehensive Guide to Jason Momoa's Many Tattoos". Retrieved February 23, 2019. ↑ "This small tattoo on Jason Momoa's chest has a beautiful back story". March 28, 2017. Retrieved February 23, 2019. ↑ Keaney, Quinn (March 28, 2017). "There's a Pretty Sweet Story Behind the Tattoo on Jason Momoa's Chest". Retrieved February 23, 2019. ↑ Kit, Borys (June 16, 2015). "Jason Momoa, Thomas Middleditch and Famke Janssen Join Bruce Willis in Action Comedy (Exclusive)". The Hollywood Reporter. Retrieved February 23, 2019. ↑ "Game of Thrones: Cast". HBO. Retrieved February 23, 2019. ↑ Wagmeister, Elizabeth (November 16, 2015). "Jason Momoa to Star in Netflix Adventure Drama 'Frontier' from 'San Andreas' Director". Variety. Retrieved February 23, 2019. ↑ Andreeva, Nellie (July 10, 2018). "Jason Momoa To Star In Apple Series 'See' From Steven Knight & Francis Lawrence". Deadline. Retrieved February 23, 2019.